If there’s something that being left-handed has taught me is how product designers often forget that we are also part of the user base; perhaps because lefties (~10% of world’s population) are statistically marginal. In my recent talk at the Inter-American Development Bank titled The All-Inclusive World Wide Web, I show how blind assumptions about users’ circumstances on the Web can alienate and exclude those in the low-end of the tech market, and explain how the path to inclusion in software begins by designing and creating with empathy. At the end of last year, I wrote up a post on LinkedIn about how sharing CV’s as static PDFs documents will most likely be regarded as a process of antiquity as the Internet Of Things infrastructure matures and robust API’s are developed for data transfer (perhaps facilitated by blockchain platforms) that enable the sharing of real-time career development data. I thought it was about time to share it here as well. What if our CV’s were smart? Think about it: no more boring, static PDFs, but dynamic web experiences that update themselves automatically, in real time, with new information about our professional and academic growth. Sure, you have a LinkedIn. That’s great. It’s on the Web, it’s digital, it’s mobile accessible and, above all, its network-building algorithm has been great for you to connect with peers, colleagues and potential employers. In fact, the algorithm is so effective that it shows you “people you may know” that perhaps you did not even remember you did, and every week or so it automatically does a job search for you. Yet, despite these technological advancements, our personal profiles mirror our PDF-bound CV’s in their dumbness: inert layered boxes where we manually input information when (and if) we remember to do so. Herein lies an opportunity to design a solution that could better communicate and mirror the ever changing nature in the “course” of our “life” or — to put it elegantly in Latin — in the Curriculum of ourVitae (see what I did there?). As the the information systems of the world move towards a mature IOT (Internet Of Things) infrastructure, I believe it inevitable, that in a not-so-distant future, your CV will transcend the confines of the PDF and become an autonomous interface powered by web services and APIs, fed by real-time data, and of course, protected by encryption technologies. The following post references a web application for testing the logic behind a website’s information structure. The app can be accessed here, and can be tinkered with here. Perhaps one of the most daunting tasks when tackling a large-scale web design projects is figuring out how to organize the website’s content in such a way that it becomes intuitive for the “average” (if that even exists) user to navigate. Despite its apparent simplicity, this is a very challenging design process that requires shedding all biases and thinking as objectively as possible with the hopes of arriving at a semi-logical information architecture anyone can navigate through with ease. I’m currently involved in a restructuring of a large Human Resources website for the organization I work for, the Inter-American Development Bank. The project came about because year after year, as new content was added and created, the current structure was not flexible nor scalable enough to accommodate the new content, which resulted in some information being buried, often many levels deep, without clear indication of where to find it. Sometimes even I, the person who is now in charge of updating the website, have trouble finding certain pages and bits of information. This time, we wanted to get it right. We want to create an information architecture that is highly user-centered– that is, a structure that accommodates to the end goals of our target audience. In no way did we want this structure to reflect how the Human Resources department is internally organized. Rather, end-user motives and needs framed as use cases shaped the way we allocated the content pages within the hierarchy. The first level provides the highest level of abstraction and each item in the menu represents a core HR area. In other words each top-level menu item corresponds to something HR does in a very general sense. The second level is the bridge that connects the high-level core HR areas with the actual pages of content. The third level is the webpage level and may further decompose into page subsections. Though the latest version of the solution has been agreed upon, it would be ill-advised to implement and deploy it in production if it hasn’t been tested. Given the limited resources we have in terms of time we couldn’t schedule “focus groups” nor complex testing environments, which is why I decided to create a simple web application that utilizes click count as the metric to evaluate the integrity of our proposed structure. The application is essentially a quiz app that presents the test-taker with use case scenarios. For instance, “I am an employee looking for a Career Development workshop”. After reading this use case the test-taker must utilize the navigation menu bar at the top to find the child-level page where he/she thinks the content related to the use-case is located. More than anything, this test measures the efficacy of the top-level navigation links, as those are the ones with higher abstraction and the ones that group and categorize the content of the information structure at all levels in the tree, often making them the harder ones to get right. As the test-taker clicks around and “digs” for the right link, the application counts the number of clicks needed to fulfill and solve the current use-case/scenario. Ideally, and because the top-level links do not expose its children links on hover, the user should take between 2-3 clicks to find the right link. Anything above 4 clicks is worth reconsidering, and anything that takes above 5 clicks to find must be rearranged. 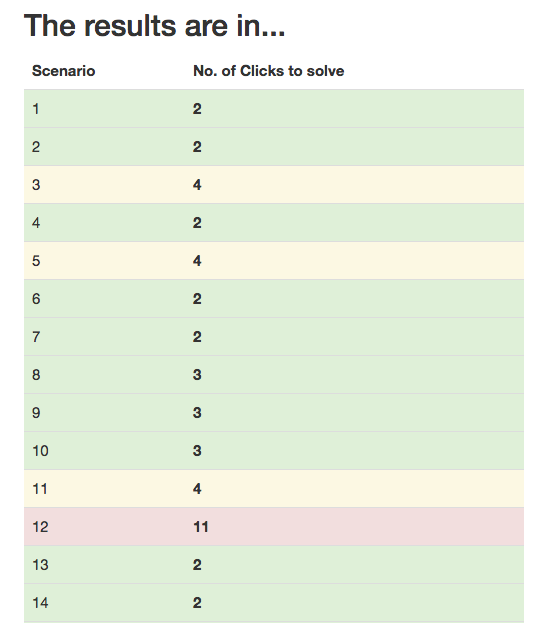 To help us with this analysis, at the end of the test, the application generates a color coded “Report Card” which lists each scenario and the number of clicks it took to solve the given use-case. Based on the scale I mentioned in the previous paragraph, each row is colored so that we can easily determine the use cases that were difficult to complete due to the current navigation structure. This mock report shows how most use case scenarios can be easily solved with the current navigation structure. Scenario #12 however (red) shows we ought to make an adjustment.